The US election may have been and gone, but whilst we were nursing our hangovers we managed to preview Rock the Bells at the O2, a rap music event that has a pretty tasty lineup for those of you who prefer your rap to your rock. We also caught Blank Canvas at 93 Feet East, amused ourself with the latest car crash known as Amy Winehouse vs Husband and got extraordinarily excited about the prospect of Britney's two week London stint next year. Looking ahead to this week however and the amazing Fleet Foxes play Shepherds Bush Empire on Monday night for a show that is sure to be amazing - everyone seems to be raving about them, from Pitchfork to the Guardian, so why not get a ticket at just £16.50 each? Alternatively, Goldfrapp play their so-so stuff at Brixton Academy - tickets are £25 a pop. For Tuesday night, if you're wanting something a bit more urban, a bit more hip hop then get excited as N*E*R*D play the Roundhouse - tickets are here. 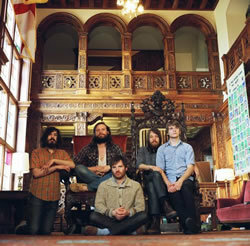 Alternatively, US folk rockers Okkervil River play Shepherds Bush Empire - tickets are just £13.50 each. Wednesday sees Ohio, USA based blues-rock duo The Black Keys play Brixton Academy - tickets are £17.50 each. Alternatively ska punk Less Than Jake play the Astoria for one of the last shows the doomed venue will be hosting - tickets are £15 each. Mercury Rev brings a hit of psychedelic rock to the Shepherds Bush Empire on Thursday night - tickets are £17.50 each. Alternatively, Scott Walker plays the Barbican, which we previewed here. Feeling a bit down in the dumps? Well, Leonard Cohen plays the O2 on Friday night, and if the ticket price of £50 - £75 each doesn't get you down, his beautiful songs will either have you reaching for the razor blades, or restore your faith in humanity, dependant on how you feel about his music. Photo of Fleet Foxes is taken from their myspace page.